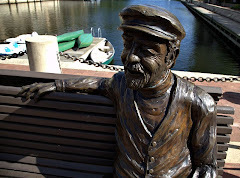 Restonian: News blog from Reston, Virginia, the mauve-colored New Town (tm): Photo Phun: I want the piece with the out-of-business tapas joint! Photo Phun: I want the piece with the out-of-business tapas joint! 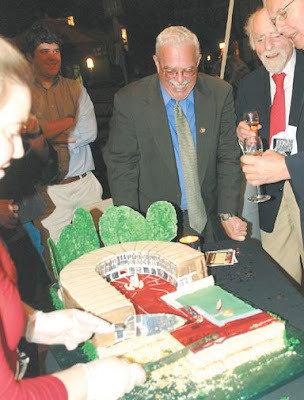 Here's as close as we get, in Reston, to an awesome paparazzi shot: This cake, created for last weekend's celebration of Reston's 45th anniversary and Bob Simon's 95th birthday delighted Simon and Congressman Gerry Connolly, the "Bennifer" or maybe the "Brangelina" of the Reston social scene, or maybe not. Notice how the unidentified cake-cutter is fulfilling the unrealized dream of razing a building so cars zipping by on Baron Cameron can get an unfettered view of the lake. For more "exciting" photos, click here. They certainly captured the dull green color of Lake Anne perfectly!